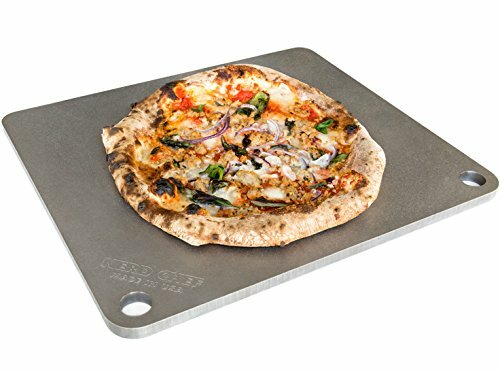 The top and bottom are bead-blasted for texture, sanded smooth by hand, then seasoned with organic flaxseed oil - pizza slides easily when you want to take it off. Finger holes make it much easier to move and reposition, plus you can hang it on a wall. And it's made in USA with solid premium steel. Steel Stone is unbreakable and we guaranteed it for life. It will develop a darker patina as you use it and it gets more seasoned. Burnt cheese and spilled tomato sauce will give it character. You can also try using it cold - put some dry ice underneath and make ice cream directly on top. Care. Treat the steel like you just like would a cast iron pan. Make sure it is dry after use, and don't store it in a humid environment, or it will rust. If any rust does develop, you can get rid of it with some wet steel wool or a scouring pad. To re-season the steel, clean it first and scrap of anything stuck to it with a metal spatula or scraper, then wipe on some oil (we recommend fresh flaxseed oil because of it's high smoke point). Wipe the oil off with a paper towel (enough will be left behind in the pores of the metal) and let it bake at 400F for an hour. If you have any questions about this product by NerdChef, contact us by completing and submitting the form below. If you are looking for a specif part number, please include it with your message.